Calumet Air Force Station is a closed United States Air Force General Surveillance Radar station. 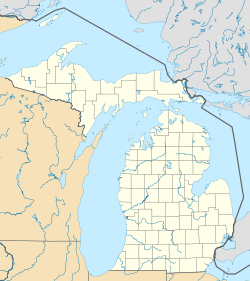 It is located 5.2 miles (8.4 km) east-southeast of Phoenix, Michigan. It was closed in 1988 by the Air Force, and turned over to the Federal Aviation Administration (FAA). Today the site is part of the Joint Surveillance System (JSS), designated by NORAD as Eastern Air Defense Sector (EADS) Ground Equipment Facility J-59. In late 1951 Air Defense Command selected the Keweenaw, Michigan site as one of twenty-eight radar stations built as part of the second segment of the permanent radar surveillance network. Prompted by the start of the Korean War, on July 11, 1950, the Secretary of the Air Force asked the Secretary of Defense for approval to expedite construction of the second segment of the permanent network. Receiving the Defense Secretary’s approval on July 21, the Air Force directed the Corps of Engineers to proceed with construction. On 1 May 1951 the 665th Aircraft Control and Warning Squadron began operating AN/FPS-3 and AN/FPS-5 radars at this northern Michigan site in early 1953, and initially the station functioned as a Ground-Control Intercept (GCI) and warning station. As a GCI station, the squadron's role was to guide interceptor aircraft toward unidentified intruders picked up on the unit's radar scopes. On 1 December 1953 the site was re-designated as Calumet Air Force Station. In 1956 an AN/FPS-6 replaced the AN/FPS-5 height-finder radar. In 1958 an AN/FPS-20 search radar was deployed at Calumet. By 1961 this radar was upgraded and redesignated as an AN/FPS-64. During 1960 Calumet AFS joined the Semi Automatic Ground Environment (SAGE) system, feeding data to DC-14 at K. I. Sawyer AFB, Michigan. After joining, the squadron was re-designated as the 665th Radar Squadron (SAGE) on 15 July 1960. The radar squadron provided information 24/7 the SAGE Direction Center where it was analyzed to determine range, direction altitude speed and whether or not aircraft were friendly or hostile. On 31 July 1963, the site was redesignated as the NORAD ID Z-16. A turn-over of equipment in 1963 left the site with an AN/FPS-27 search radar along with AN/FPS-26A and AN/FPS-90 height-finder radars. The AN/FPS-90 was removed in the late 1970s. The 665th Radar Sq was inactivated and replaced by the 665th Air Defense Group in March 1970. The upgrade to group status was done because of Calumet AFS' status as a Backup Interceptor Control (BUIC) site. BUIC sites were alternate control sites in the event that SAGE Direction Centers became disabled and unable to control interceptor aircraft. The group was inactivated and replaced by the 655th Radar Squadron as defenses against manned bombers were reduced. The group was disbanded in 1984. Over the years, the equipment at the station was upgraded or modified to improve the efficiency and accuracy of the information gathered by the radars. Calumet came under Tactical Air Command jurisdiction in October 1979 with the inactivation of Aerospace Defense Command and the formation of ADTAC. The station then underwent cease-operations about that time, and the AN/FPS-26A height-finder radar was removed, but the site closing was soon reversed (Allegedly due to Calumet AFS being the only station to pick up a simulated air incursion). On 30 September 1988, the site finally closed permanently. Calumet was then reconfigured as an Air Force Joint Surveillance System (JSS) site, initially with only the AN/FPS-27. An AN/FPS-91A replaced the AN/FPS-27, and later an AN/FPS-116 height-finder radar was installed. The former station was used by Keweenaw Academy, a reform school. Today Keweenaw County owns the site. It is now only used for radio communications (cellular, amateur radio, etc.) The facilities are visibly degrading in a very remote area. Major Roger W. Gottschall 1965 - ? Lt Col Scott Meyer, 1985-1987 - The men and women of the base earned the Outstanding Unit Award during this time. Redmond, Kent C.; Smith, Thomas M. (2000). From Whirlwind to MITRE: The R&D Story of The SAGE Air Defense Computer. Cambridge, Massachusetts: MIT Press. ISBN 978-0-262-18201-0.